I love it when a cookie looks fairly ordinary at first glance and then really “wows” you when you bite into it. These cookies fit that description perfectly. They might not look like much at first glance – thin, with no big chunks of chocolate, nuts or any other add0ins – but they win you over in one bite. 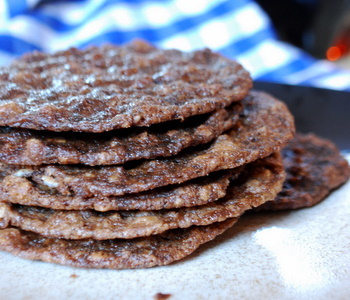 They are thin and crispy, with an almost lacy texture that makes the cookies feel very light. You can taste oatmeal and butter, along with sugar and a bit of salt, with a hint of chocolate and hazelnut from the addition of a bit of Nutella to the batter. They are simply delicious. These cookies spread a lot during baking, so it’s important to leave plenty of room between the cookies when you are placing them on the baking sheet. You don’t need much dough to make each cookie; one teaspoon of dough turns into a three inch cookie, give or take a little. They get their spread from a couple of sources, including butter/fat, leavening and a relatively small amount of flour. The fat keeps the cookies crispy, while the leavening and the relatively small amount of flour contribute to a delicate texture. Nutella, in case you’re not all that familiar with it, is a delicious peanut butter-like spread that is made with cocoa and hazelnuts. You can make your own at home, but it’s pretty easy to find it in many grocery stores, and some bigger stores like Target often stock it on their shelves, as well. These cookies will be fairly soft when they first come out of the oven and will harden as they cool. Let them set up on the baking sheet for at least 10 minutes before transferring them to a wire rack to cool. Once the cookies are cool and crisp, store them in an airtight container and they will keep their crispiness for several days – if the batch lasts that long. It’s easy to eat these two at a time, and they’re likely to go faster if you have coffee or vanilla ice cream around that need accompaniment. In a large bowl, cream together butter, Nutella and the sugars until mixture is fluffy. Beat in the egg and the egg yolk, followed by the vanilla extract. Working at a low speed or by hand, gradually blend in the flour mixture and the oats (if you donâ€™t have quick-cooking, pulse whole rolled oats in the food processor to chop them up a bit). Drop teaspoonfuls of the batter (1/2-inch balls) onto prepared baking sheet, leaving at least 2-inches between cookies to allow for spread. Bake for 10 minutes, until cookies are set. Cool on baking sheet for 10 minutes, then transfer to a wire rack to cool completely. I LOVE LOVE LOVE Nutella. These look wonderful and I am definitely going to try them! Yum! I’ve never baked with Nutella. I’ve always just slathered it on bread and other stuff. I’ll have to try this out. I have never used Nutella to bake with, but this is one recipe I plan to try. Thank you for such a great Valentine’s Day treat. If I take this to school, my students will go wild. As an avid Nutella fan looking for something simple and new, I tried this recipe today. Texture was great, but somehow I found them a bit…salty? I followed the directions to the letter, used normal oatmeal, etc. The only thing I could think of is the large amount of baking powder giving it a more (can’t think of a better word) “chemical” taste. Can’t really explain it, maybe it’s just not a flavor combination I like. Will bring them to work and see what the verdict is there. Awesome looking cookies. I am going to try and make these with my dear daughter she loves to help me cook. These seem to be delicious!! I’m a major Nutella lover, so I’m sure I’d love these. 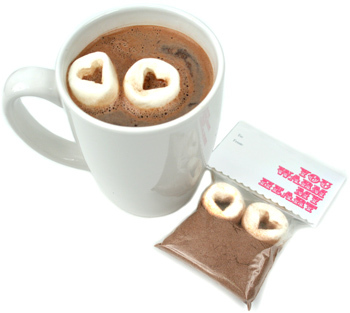 Wow, these look great – glad to find another way to enjoy nutella! Thanks. Lisa you’re right that does seem to be a large amount of baking soda and baking powder, though i’m not as familiar with the lacy cookies. But should those be tbsp, or tsp? Hi Everyone – The amount of baking soda is correct: 1 tbsp. The amount of baking powder is 1 1/2 tsp. This looks great. I need to get a new jar of nutella for this. I’ve also nominated you for the Lemonade award. Come by my blog to claim your award. Thank you for the recipe, sadly I did not print the new version with the adjustment for baking soda. My son and husband loved them, my daughter and I liked them but not in love…. I look forward to trying them again with the new measurements. My only contribution, parchment paper produced better looking cookies than the Silpat mat. Do you have experience/comments regarding the difference? Thanks for the great blog, I love it! These were a huge hit at work no one including me has ever had anything quite like them. They are unexpected in the best possible way. I made a 1/3 recipe batch of these today using the baking powder and soda amounts showing in the recipe now – SO good! Not too salty or too anything, thin, a little crispy and a little chewy, and delicious. Thanks for such a unique nutella recipe! Is the batter supposed to be runny or like a soft dough? Have I done something wrong? Nevertheless, they still turn out great! I had the same problem as rykiel; maybe using too much dough? I definitely dropped more than a 1/2 inch diameter on the cookie sheet. Nevertheless, they are GONE: Yum! These cookies are delicious! I made them for a party, and while they aren’t that pretty, that didn’t stop anybody from devouring every single last one. These didn’t work for me. Same problems as others–didn’t get thin or crispy, didn’t taste much like Nutella to me. Threw them out and I’m now making shortbread.